Liam Brady of Arsenal. Pic by Mirrorpix. Immortalised in the murals on the walls of the Emirates Stadium, dominant midfielder Liam Brady is an Arsenal great. Born into a footballing family (his great uncle and brother were both Irish Internationals), Brady was to become the most successful of the lot, making 72 appearances for his country and a further 307 for Arsenal. Known for his playmaking vision, Brady injected culture and intellect into the dullest of games. Having joined Arsenal in 1971, aged 15, legendary Hall of Fame manager Bertie Mee gave Brady his debut in 1973 against Birmingham City. Brady had a sporadic first season but managed to make himself a first team regular by 1974-5. The likes of Malcolm Macdonald and Frank Stapleton gorged on chances conjured up by Brady. His technical abilities and skill helped Arsenal emerged from their mid-Seventies slump and reach three successive FA Cup Finals between 1978 and 1980. It was the 1979 final that highlights Brady’s importance: he set up first-half goals for Brian Talbot and Frank Stapleton as Arsenal tore Manchester United apart. The match has been labelled the ‘Five Minute Final’: United pulled back 2 goals to equalise by the 88th minute. Brady began the move which allowed Alan Sunderland to fire Arsenal to 89th minute victory. 19/08/1978. Pic courtesy of Mirrorpix. ‘Chippy’ (as he was affectionately known), was equally as impressive in the League: firing a vicious curling shot past ‘Spurs in a famous 5-0 victory against their rivals. He was voted PFA Player of The Year in 1979. 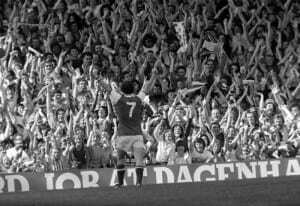 But then Brady made the decision to leave Highbury for Juventus at the end of the 1979/80 campaign where the Irishman won two Italian Championship medals. He remained in Italy, playing for Sampdoria, Internazionale and Ascoli before returning to West Ham in 1987. Brady brought his fine knowledge of the game back to Arsenal, becoming Head of Youth Development for the club in 1996, overseeing the development of the likes of Ashley Cole and Jack Wilshere.